The patented dreamgenii Pregnancy Pillow is Recommended by Midwives across the UK and is recognised as the only specifically designed pregnancy pillow to adequately support back, bump and knees at the same time without taking up all of the room in the bed. 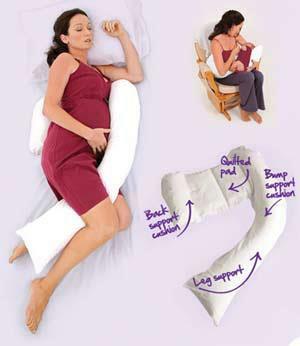 It encourages you to lie on your left side which is the best position for mother and baby (But is just as comfortable on your right by passing the leg support through the back of your knees) and gently prevents you from rolling on to your back during your sleep (Which can restrict bloodflow to your baby). 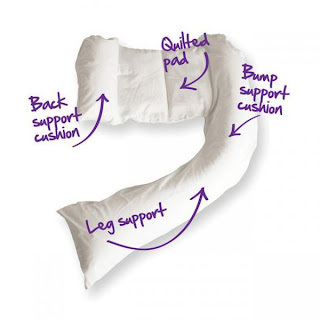 Using the dreamgenii Maternity Pillow from about 20 weeks pregnant, can also encourage your baby to adopt the optimal birth position which can mean a shorter and less painful labour. The dreamgenii pregnancy pillow used as a breastfeeding support, is designed to support your back during feeding and keep the baby at the correct height and position for breastfeeding. The dreamgenii Pregnancy Pillow has now been certified by the European Medical Devices Directorate as a Class 1 Medical Device. It is used by thousands of women during pregnancy, as well as by NHS midwives, breastfeeding coordinators and in NHS delivery suites to provide comfort and support to pregnant women and new mothers.